Is your business the best kept secret in town? We have a solution for that! Are you still investing hundreds or thousands of dollars every year in traditional advertising for your small business? What are your results? Times have changed. Your customers are online and they are looking for you there too. Marketing your business online to your local market may seem daunting, or you may feel it will take too much time to learn a new way of doing things. However, online marketing for local business offers you an extraordinary opportunity to connect with your customers in a way that results in more leads, more sales and greater customer loyalty. Whatever your experience is with reaching your local customers online, we are here to help improve your results by cutting your advertising costs while increasing your sales. Here are some areas you may want to consider including in your online marketing plan. The hub of all of your online presence is your website. 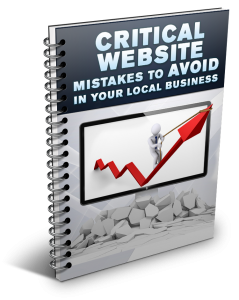 Make sure yours is set up for success Grab our free guide, Critical Website Mistakes to Avoid to see hif there are any holes in this most important foundation for your online marketing efforts.Grab your copy below, read through it then let us know if you have any questions.